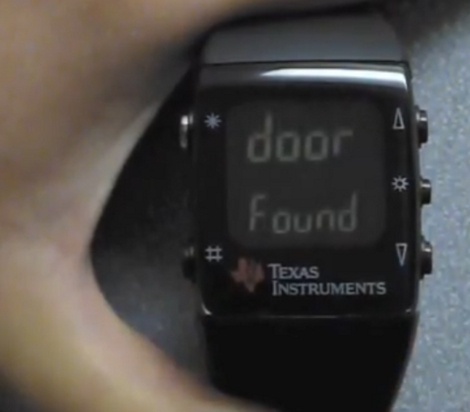 [Ziyan] and [Zach] built a door entry system that uses a code entered from your wristwatch. They’re using the TI eZ-430 Chronos that we saw in November. There is a project box mounted over the deadbolt lever. Inside, the wireless fob waits for the watch to connect. When a watch has connected and the correct code is received (using 128 bit encryption) the fob actuates a servo to turn the lock. On the user side of things the code is entered by tapping the watch. The built-in accelerometer picks up these taps and relays them to the door unit. It’s a heck of a project! Check out their demonstration video after the break. We’d like to see a mechanical option for escaping the apartment in case the door unit fails but otherwise we think this is perfectly executed. We’re looking forward to seeing more projects that tap into this TI hardware. Pretty awesome, it’s a little bit of two-factor authentication (something you have, something you know), and a pretty clean installation. The “have” factor makes it a bit better than the “knock to enter” solutions, and the “tapping” is relatively quiet (and as such, would be harder to “sniff” by recording sound/camera). It looks like the range is even pretty good on that thing… might have to source one of those to play around with myself. Good stuff. Awesome project, awesome watch platform. not really a hack, more a clever use of servos and RF devices…. what happens when you run out of batteries or lose your watch? wow, it is a really nice project, the only thing i’d change is the reed switch, i’d put it in the servo/pcb case to protect it..
but then you might need a stronger magnet. maybe a neodynium? I’d been thinking of getting one of these for a while, but seeing project like this sealed the deal. A little overkill unless you are Fort Knoxx. A little expensive as you better hope your watch lasts more than two years as I haven’t had one to last more than a few years. Great job on this one. I was looking forward to see what people were gonna do with this watch. I really like the idea of using the accelerometer as an input source. Wow … This rules. TI really pulled something with their watch platform. I’m definitely getting one too ! @ Kirov , if you saw the movie you would have seen that you still can use you’re key in case of dead batteries or loss of watch . What is a hack but the clever re-purposing of the world around you? I don’t think *everything* is a hack, but come on, this is cool, and its a hack. Sweet, I’m totally throwing that in with my next DigiKey order. Digikey.ca does the whole duties and taxes thing right on its site so we don’t have to pay UPS/FedEx/Canada Post their brokerage and handling fees. You definitely can still use the door without power. In fact, we had to do this for a couple days during testing. However, you need to be careful and turn slowly, as you are turning the shaft of a high-torque servo as well as the lock. @isama – Yes, we wanted to put the reed inside the box too, but it wasn’t possible with the magnets we had. I am considering some alternatives now, like better magnets or perhaps a plain ol’ switch. Very nice hack. But I hope your lock does not malfunction when your roommate want to leave in a hurry. Very nice hack of the watch features, way to think outside the box using the accelerometer that way! This is also one of the few “dorm room lock” projects that actually involves a fair bit of security. Anyone could learn your knock or sniff a plaintext rfid message (someone sniffed my bus pass last year, luckily it was a buddy of mine) but very few people have ths particular watch and the message is also encrypted! The only major change I would make is to have a mechanical lever or something to allow you to move the lock from the inside without opening the box if the power fails you. This is a sweet hack and deserves the props! I hope to see more like it! Determine your cup size. The most accurate way to determine your cup size is by using your current bra size as a starting point. The cups are sized relative to the band, so if you were to try a smaller band size but keep the same cup size, the cups would be too small. Instead, you must increase the cups by one size for every band that you go down. For example, if you are currently wearing a 34C bra and your underbust measures 31 inches, then you will most likely need a 32D. On a 30 ” band, this would be a 30DD etc. formula for natural breast enhancement, we thought it was definitely worth a If the band is roomy enough for you to be able to comfortably fasten it on the tightest adjustment, try a smaller band, for example if a 32D is too loose, try a 30DD. Remember that the cup size has to be changed when you move to a different band size – for every band you go down, you must go up by one cup size in order for the cups to remain the same capacity and vice versa. And this in no way slights the projects, but it is NOT a hack. A “hack” is taking an item that was intended for a given purpose, and re-purposing it. As a “hack”, this is no more a hack than writing a program for a PC. It was *intended* to be used in ways like this. TI developed the platform EXACTLY for such purposes: for developers to come up with nifty ways to use it. Just because it’s shipped as a watch doesn’t mean it has to be a watch. And as a watch, it’s quite a super-set of a normal watch: From TI, the loaded application allows you to use the accelerometers to be a wrist-mounted mouse; the push-buttons can be used to control a PowerPoint presentation; and, oh yeah, it tells time. So: NOT A HACK. It is a very cool use of a programmable platform that TI developed for out-of-the-box thinkers like these guys. Great use of the watch. I like this idea much better than the finger print scanners or the normal RFID systems. What about the possibility of using induction to power the locking/unlocking mechanism? You only need power to the system when the door is closed, after all, and this would negate the need for batteries. The first thing this reminded me of was the Spy in TF2. Nice use of the watch incidentally.